DAY 6 – ¡High! in the Mountains of Catequilla-Chambo. Today the group set off to Catequilla-Chambo, a region located at the lower part of a mountain. The village was much more small in size and population compared to the ones previously visited which were located higher up in the mountains. 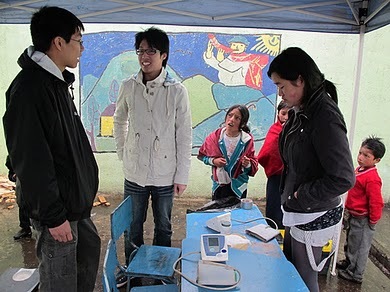 I worked at the dental station and assisted Tanya, the dentist, in treating over 30 people. 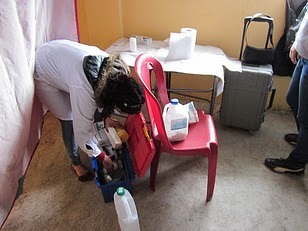 The tasks I was responsible for included sterilizing the used tools with alcohol, handing the appropriate tools and supplies to Tanya, and comforting the patients during the treatment. It was a good opportunity for me to learn the names of the dental tools in Spanish and what they were used for. For example, carpul was used to inject the anesthetic into the gum, while gutaperchero was used to spread the cavity sealant on the tooth. Another tool named explorador was used for scraping out the plaques in between the teeth. Patients were treated with fluoride in prior to protect their teeth, where most of them were children who had rotten or wobbly tooth. For most of the times, cavity sealant was used to treat a rotten tooth but in severe cases the tooth had to be plucked out. There was one case in which an eight-year-old girl had broken roots and a few projecting tooth in wrong positions. Due to long periods of negligence the pus in her gum had decayed the gum so much that it could not absorb the anesthetic. It was tough for her to tolerate the pain of plucking the tooth out; all I could do was hold her hands. There was another woman who had dental problems that gave discomfort in everyday life that was impossible to solve since they were left that way for such a long time. Earlier treatments would not have led to such situations. Seeing those people in pain due to inaccessibility to simple treatments made my mind heavy and made me once again appreciate the benefit of the available health care that we have back home. Taking part in MEDLIFE brigade provided me with so many valuable experiences. Being able to work right beside professional doctors and dentists and assisting them is not a common experience that one can get at our age; it is a chance for me to encounter various aspects of medicine and move one step further toward my dreams. In addition, although we are here to help these people, I feel that I am the one who is learning and gaining from them as days go on. I could sense that speaking different languages is not a problem at all in conveying feelings of gratitude and sincerity towards each other. A Little bit of French in the Clouds!